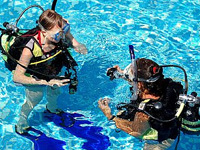 Join us for the Rose Park Scuba class! Dive in for some fun. The Billings Parks and Recreation Department, in partnership with Adventure Scuba is offering the PADI Open Water Diver Course at the Rose Park Pool. The course is the first step towards becoming a certified diver. As a PADI Open Water Diver, you’ll explore the underwater realm, see new creatures and experience your world from an entirely new perspective. and you’ll enjoy the excitement and camaraderie that come with the PADI Diver lifestyle. The course prepares the student diver for their certification dives. The course will be conducted in the Training Center at Adventure Scuba and the Rose Park Pool. Prior to the beginning of the class the student diver will need to complete the PADI eLearning online course. (Included in your registration) HINT: Allow yourself enough time to complete your homework! Upon successful completion of the course, the student divers are prepared to complete their PADI Open Water Certification. The certification dives are available through Adventure Scuba for an additional fee or can be arrange through a PADI Instructor anywhere in the world. Prerequisite: There is a Medical Statement that must be completed prior to class. Please read the instructions for this form. Give us a call at the shop if you have any questions. Download Medical Statement here. Registration is completed through Billings Parks & Recreation. Once you’ve registered, bring your receipt to Adventure Scuba to pick up your course materials and receive your eLearning code.